Bruce Hood asked his friends to help name his new pup. Here’s what he eventually told them. Thank you all for your interest in naming a dog. It may seem strange to you, but dog naming has had a lot of meaning in our family. I guess it may have something to do with the stories my dad told me about my name and the dogs he had when he was growing up. He used to tell me with pride that I was named after his favorite dog as a kid: Bruce. I’m not sure I believed him then but I took solace in knowing that I had an Uncle Bruce on my mom’s side of the family. I did not spend a lot of time thinking about it. I was just glad that he didn’t name me after his second favorite dog: Jeep. Ten years later, as Copper slowed down and we were facing the decision of what to do, we couldn’t stop thinking how great a dog he had been. Stealing toys from the kids on the Homestead beach, fishing all of the trout out of the stocked pond up at the Homestead, and even swimming in the pool at the Homestead Beach Club. We always loved those great calls from Anna Anderson to let us know Copper had jumped in again. Everyone loved Copper. When we went to the beach in summer and left Copper at home, people would come up to us and ask where he was. He was a favorite part of so many kids’ vacations on the beach in those days. He would fetch the balls and sticks and stones that they threw for him until dark. In Copper’s last days, we found another pup for him to mentor. By this time we had found that Leelanau had truly become our home. And so, Leelanau’s Little “Bear” became part of the family. In those days, Laura and the kids would spend every Friday night down at Beach Bards Bonfire singing songs and listening to Norm Wheeler and all the stories. The Legend of the Sleeping Bear, a story I grew up on, became part of us. By telling the Native American story, Anne-Marie Oomen would captivate our two kids, Ian and Jessie, and they were transported out onto the big lake, where the heartbreaking parable takes place. So, Bear became the newest member of the family. Almost 16 years later, Bear is winding down. With bad breath, sore hips, no hearing and about a third of a good eye, he has slowed down a bit. A twice-daily trip to the barn to feed the horses is about the limit to his activity—on a good day. But I slowed as well. I had tired of chasing a flushing dog through the coverts looking for woodcock. He could find them, but I may or may not have been at his side. So a pointer (English Setter) has replaced our family labs. And like before, Leelanau shapes Leelanau “Blue” Waters’ name. We have certainly spent enough time in it. Your suggestions were great. But it came down to me visualizing myself running through the woods after a dog that I can’t control yelling F#*#%^#$ Harrison!!!! It just didn’t seem to honor the man in the way so many suggested. So thanks for your thoughts and welcoming Blue to the family. 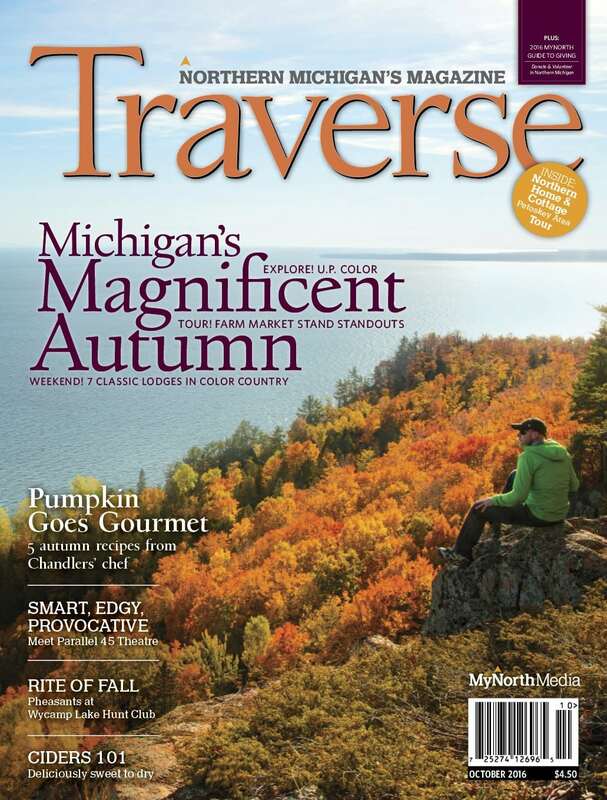 This column was originally featured in the October 2016 issue of Traverse, Northern Michigan’s Magazine.